Have you ever wondered how a human being could run for 26.2 miles straight? They break down this large feat into small daily increments in order to build the physical and mental strength needed to cross the finish line. It’s smart to approach NCLEX prep in the same way. With the potential for up to 265 questions and a full six hours, you’ll need all the mental stamina you can muster. 1. Consistency is key. Progress towards any goal is only achieved through consistent effort—an hour a day spread out over a few months will get you much further than day-long cram sessions the week before. Kaplan will help you develop an individualized study plan for success. If you follow this comprehensive model consistently, you’ll gain the confidence you need to conquer the NCLEX. Don’t sell yourself short by thinking a few cramming sessions will be enough NCLEX prep to get you prepared. 2. Train by priority, not fear. While it is tempting to only focus on learning more content—what you really need is to train your mind to answer NCLEX-level questions in a Computer Adaptive Testing environment. Passing-level NCLEX questions are written at the highest levels of application and analysis. They are more intense than the average nursing school exam. Refocusing your priority towards learning “how to” break down these questions and eliminate answers will have the most significant impact on increasing your score. 3. Watch your own “game films”. The time you spend reviewing completed practice questions is a critical training strategy. Kaplan teaches you how to review your questions and identify the three key areas of student errors in Computer Adaptive Testing. That way you can identify your weaker areas and learn specific strategies to overcome them. Reviewing the rationales for each of the correct and incorrect answers and thinking through how you selected your answer will provide invaluable information about your personal testing strategies. 4. Make your own playbook. 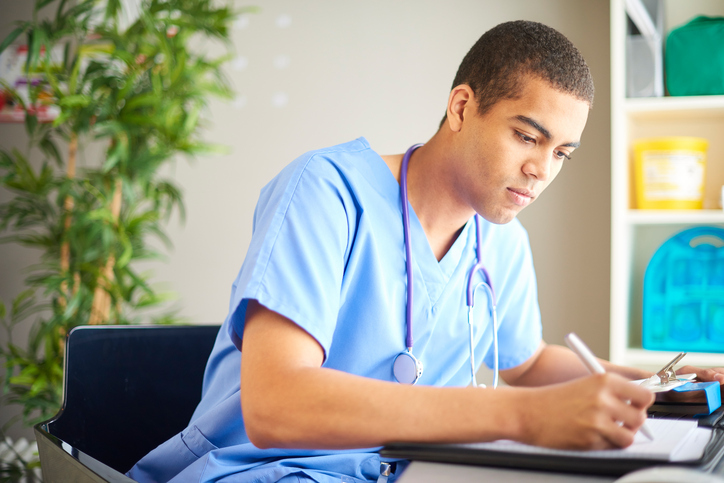 Another powerful NCLEX prep strategy is to keep a notebook. As you are reviewing questions and target studying content, keep the same notebook with you and write all your notes. For example, as you’re reviewing your practice question rationales, write a brief note for any content that was new or unfamiliar to you. Then make it a habit that you review this notebook daily. This is called “rehearsing” and is one of the most effective ways to transfer that content from your short-term memory (which “evaporates) to your long term memory (where you can retrieve it on the NCLEX). 5. Practice in a test-like environment. While all the above tips are certainly useful, nothing will help you quite like rehearsing the test itself—start to finish. Can you imagine an actor doing a whole show for the first time in front of an audience? Sit down at a computer, use a mouse, and time yourself. You don’t want any of these extraneous factors getting in your way on Test Day.